Please note - tours are best viewed in full screen mode. 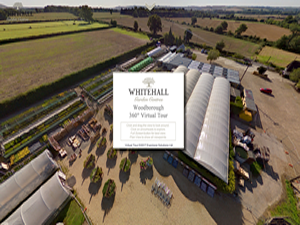 "Whitehall Garden Centre - Woodborough"
This tour was built with a combination of aerial and ground-based panoramas to create an integrated virtual tour of Whitehall Garden Centre at Woodborough. 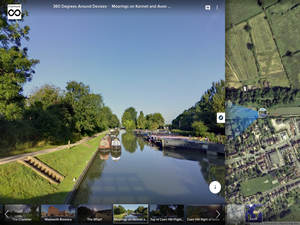 It uses a Google Streetview style of navigation, combined with a aerial plan view, to provide rapid navigation to views of any part of the site. This tour has been built from images captured on a day trip, with no prior arrangements or pre-planning. The ball camera was mounted on a hand-held monopole and the photographer edited out in post. A map has been incorporated in a side panel to aid navigation and visualisation, and an off-the-shelf skin used for speed and polish. 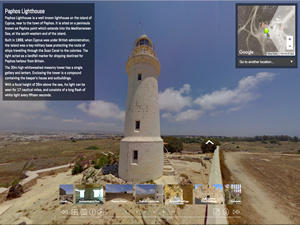 This tour has been built from images captured on a trip to Paphos in Cyprus with no special arrangements. There are a variety of shots, some hand-held, some using a tripod, some taken indoors, and some aerial panoramas taken using a hexacopter. It was built with a significant amount of custom code and incorporates a floating, draggable info panel and map, and hotspots and thumbnails, which can be hidden to give uncluttered panoramic views. 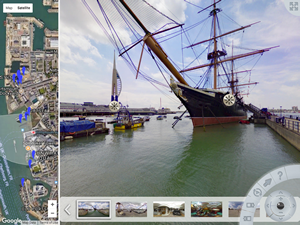 This tour has been built over a period of time with additional panoramas being added as they were taken. Most shots were either taken with a fixed monopole or aerial shots from a hexacopter. It uses a third-party virtual tour hosting service, which is quick and simple to set up, but less flexible and slower than a more customised solution.